Buying a wedding ring is an investment that you get to see every day and that demonstrates your love and commitment for another. Its meaning is so important that it is essential to get it right. Traditionally a plain band is worn, but the possibilities are endless. Our guide aims to touch upon a few options and some of the decisions to be made. Jason Keith works with both gold and platinum. A good starter point would be to choose a colour and often based on what your partner already wears. The options include yellow, rose or white. The most popular trend at the moment is white (White Gold or Platinum). 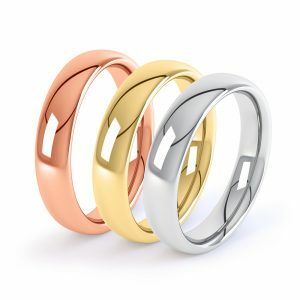 Yellow, rose and white gold are all ‘real’ gold. When gold is used to make jewellery, pure gold is not used as it is too soft. Instead alloys of other metals such as silver, palladium and cooper are added to it. It is the type of alloy used that determines the gold’s colour. All colours retain the same percentage of pure gold and therefore both their cost and quality characteristics are very similar. The percentage of pure gold determines the carat (not to be confused with carat, a diamonds weight). You will need to decide what profile you would like. Comfort and style are the key variables in aiding your decision. 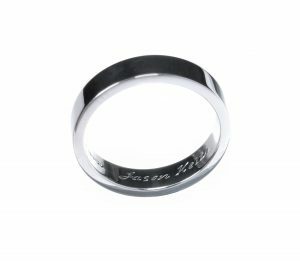 Depth, width and shape of the band can be variable with a larger width and bigger depth resulting in less comfort and increasing the price tag. All attributes can be balanced against the style you’re after. Or if you have an engagement ring and want the wedding ring to sit flush next to it a shaped band would be best. The most traditional of wedding bands – curved on the inside and out for a comfortable fit. Rounded on the outside, flat on the inside. Fits against a lot of engagement rings. Curved on the inside and outside similar to the court but is not as deep. A square profile, with a contemporary feel. The opposite of a D-shape: flat on the outside but rounded for comfort on the inside. We have many different options available including plain, decorative, diamond and multi-metal. Please visit our products page to give you more of an idea. Traditionally a wedding band is plain but men often now opt for a single diamond and women; well they just love diamonds! You may want diamonds all the way round the band, or half way round or just on the shoulders. Either way diamonds are an investment so please see our diamond guide for more details on what diamonds to choose.